Public protests against the government are growing, but the chances of serious political change are limited by opposition weakness. Russia President Vladimir Putin’s short visit to Belgrade changed nothing. If anything, it was embarrassing for the Serbian public and for Aleksandar Vučić, the President of Serbia, in particular. Mr Vučić mobilised thousands of supporters to greet Putin in front of the main church in Belgrade with the hope that Putin would talk to them and commit Russia to supporting Mr Vučić, who faces growing and ever more loud protests in the streets and opposition in the public. Putin just thanked them for their friendship. And left. This was a fitting end to an unambitious visit with few concrete accomplishments. 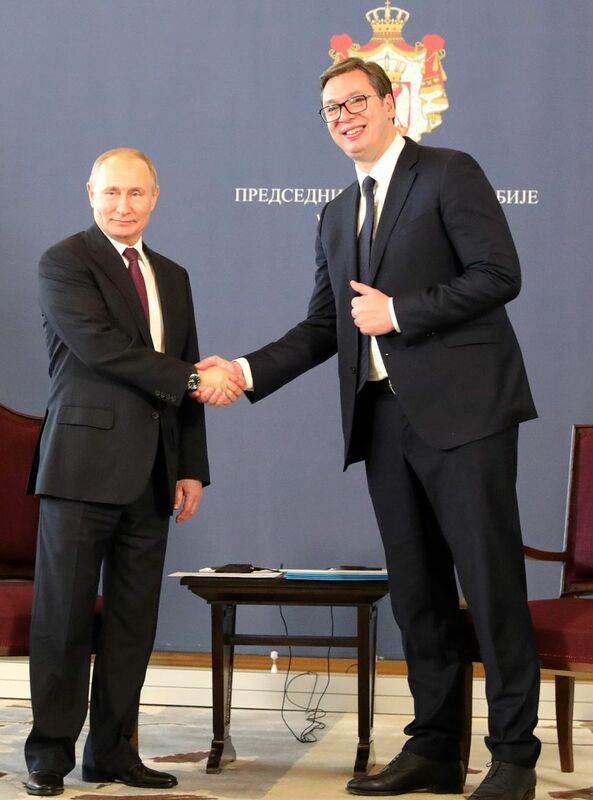 Vučić was decorated by Putin. Milorad Dodik, the leader of Bosnian Serbs, was encouraged. And Mandić and Knežević, the leaders of two Serbian parties in Montenegro, were congratulated for their bravery in standing up to the government of the newest member state of NATO. However, the association agreement with the Eurasian Economic Cooperation Organisation was not signed, as expected, because there was no agreement on tariff-free Serbian exports of cars and cigarettes and agricultural products. In addition, it was announced that the start of the building of the pipeline for the Serbian part of the Turkish Stream was imminent, but this is a cargo cult type of a project at the moment, like the South Stream was few years back. Other agreements that were signed were either the continuation of already existing projects, or inconsequential. The visit certainly did not pacify the opposition, which continued to come out on the streets of Belgrade and other towns of Serbia to protest the increasingly authoritarian government. Nor was the public impressed by Mr Vučić’s meeting with German Chancellor Angela Merkel in Davos a few days later. The upcoming visit by French President Emmanuel Macron may prove to be more consequential, depending on what he decides to do. For example, if Mr Macron agrees to meet with the opposition, or talk about the stalled EU-mediation negotiations between Serbia and Kosovo, that could be consequential. In any case, as of now, protests will continue. The challenge for those protesting, and for the opposition parties, is how to move from protests to politics. The protests are against Mr Vučić’s authoritarian rule. In the EU, Mr Vučić is seen as authoritarian mainly because of his control of the media, although there are also criticisms of the lack of rule of law and corruption, and of the captured state character of his governance. Internally, however, the main complaint is the lack of free and fair elections, and specifically what is seen as the illegal and illegitimate concentration of power. Mr Vučić’s rule is viewed as illegal and illegitimate because Serbia is a parliamentary democracy, while Mr Vučić is running the country as if it were a presidential system in which he has the government and the parliament answer to him. Mr Vučić’s authoritarianism is therefore not about the inability to win elections, because he has won several, but the subversion of the constitution. Thus, while Mr Vučić contemplates early elections, perhaps in couple of months, which he would be likely to win, the opposition is getting ready to boycott them. Indeed, the Democratic Party, one of the main opposition parties, decided not to participate in the parliamentary proceedings, and to join the out-of-parliamentary opposition. The developments are starting to look like those in Macedonia which eventually led to a change of government. The difference is that in Macedonia the protests were led by the main opposition party, which managed to survive years of authoritarian rule and a series of election defeats. In Serbia, the protests are not led by an opposition party, but they are a civic uprising. This is in part due to the fact that Mr Vučić has succeeded in minimising and almost destroying the opposition parties, in particular the Democratic Party. Therefore, while in Macedonia the public joined the party protests, in Serbia the opposition parties are joining the civic uprising. The dynamics, however, may end up being similar. In Macedonia, the previous increasingly illegitimate authoritarian government succeeded in winning elections as long as it had outside support. This gave it some kind of external legitimacy. Once US and then EU gave up on it, however, as it became increasingly ineffective domestically and internationally, somewhat fairer and freer elections were agreed on with mediation by the EU. A technocratic government took over to prepare and oversee them. Once external legitimacy was lost, the opposition won on the back of dissatisfaction with authoritarianism. The Serbian opposition is hoping for the same outcome. This is why the visits by Mr Putin and Mr Macron, as well as the meeting with Ms Merkel, are important. They signal that the leader is still externally legitimate. External legitimacy, however, is usually dependent on the ability of the ruler and the government to deliver on international obligations. In the Serbian case, that means a solution to the Kosovo problem. The Serbian opposition believes that Russia will not support the German and EU project of normalisation. “Normalisation” in this sense means that Serbia will not stand in the way of Kosovo’s membership in international organisations, most importantly the UN, but it would not be required to extend official recognition to Kosovo. There would also be a legally binding agreement that Serbia, if it enters the EU, would not use its membership to frustrate Kosovan accession. The opposition also believes that Putin would not be happy with such normalisation. The government is has committed to the EU to deliver it, but would now rather get out of that obligation. While Mr Vučić himself is ostensibly committed to the normalisation process, his foreign minister and the Serbian Church are publicly expressing hopes for a Trump-Putin agreement. The Church has most at stake in Kosovo and hopes that Trump and Putin will be sensitive to religious arguments. This, the thinking goes, would either deliver territorial separation, e.g. annexation of the north of Kosovo to Serbia (pushed by the foreign minister) or the implementation of Resolution 1244 by the UN Security Council, on the understanding that this will deliver substantial autonomy of Kosovo within Serbia. The latter is the position of the Serbian Church and Mr Putin, at least as far as his cryptic statements in Belgrade can be understood. Therefore, the opposition is hoping that Mr Vučić will not be able to deliver on his international obligations on the issue of Kosovo. That would render him useless to his international partners. In that context, the Macedonian way of organising free and fair elections is what the opposition is hoping for. The difference is that the opposition parties, which are weak and unpopular, are promising not to seek power, at least not in the first round of elections, which should only see the end of Mr Vučić’s rule. Only the next election would be for parties rather than against authoritarianism. The weakness of the opposition parties is why the Serbian legitimacy crisis is only in its early stages. On the one hand, they have next to nothing to offer to achieve external legitimacy, in stark contrast to the Macedonian case, while they hope to come to power on the back of the civic uprising that they cannot offer leadership to. There is therefore still a long way to go to turn protests into politics. The way forward is to get the EU to start pushing the Serbian government towards democratisation as in the Macedonian case, but that would imply a pro-EU stance, which is not where the opposition parties, or rather their umbrella organisation, The Union for Serbia, is at the moment. And they certainly cannot hope for support from Putin irrespective of their pro-Russian position when it comes to Kosovo. If they come to power, they will be unreliable to Putin, while a weakened Vučić is just the right type of an authoritarian from Moscow’s perspective.